Many, many role-playing game companies have been tempted into doing RPG adaptations of established media franchises, such as books, TV shows, or movies. The attraction is obvious; the product comes with a built-in market. Unfortunately, there are also many, many pitfalls. Many of the companies who have dabbled in licensed products have emerged from the experience poorer for it. There’s a trick to surviving adaptations and not every company has it. 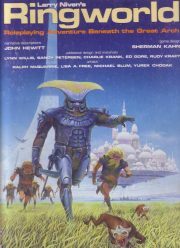 that Chaosium Games had acquired the rights to do a role-playing game based on Larry Niven’s Ringworld (a title that did not at that time inspire feelings of melancholy and despair over the decline of a once-great author). Not only had Chaosium created Runequest, one of my favourite RPGs, but they had ample experience at turning literary properties into games . By 1983, Chaosium’s licensed products included Thieves World, Stormbringer, and of course Call of Cthulhu. It’s not entirely true to say that Ringworld the RPG got caught up in Development Hell but I do think it’s safe to say the project turned out to be bigger than John Hewitt or any of the other people involved could have envisioned. 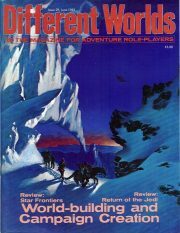 Despite delays, Larry Niven’s Ringworld: Roleplaying Adventure Beneath the Great Arch was finally released in 1984 . And what did a youthful James find when he popped open his copy of the game?